This week got off to a bit of a rocky start. Monday morning kicked off with an idiotic car accident. Everyone was fine but a driver decided to swerve into my lane and plow right into me despite me being in his view. After dealing with all the insurance hassles, I discovered my back was killing me from the accident. Dr husband has ordered me to sit at home against a hot water bottle pacing Advils. This is not how I expected to spend my week. And the more someone tells me to sit still, the more there is to do! I've already broken the rules a few times, oops. Luckily, I saved this post from a while back to share with you while I sit around on house arrest. 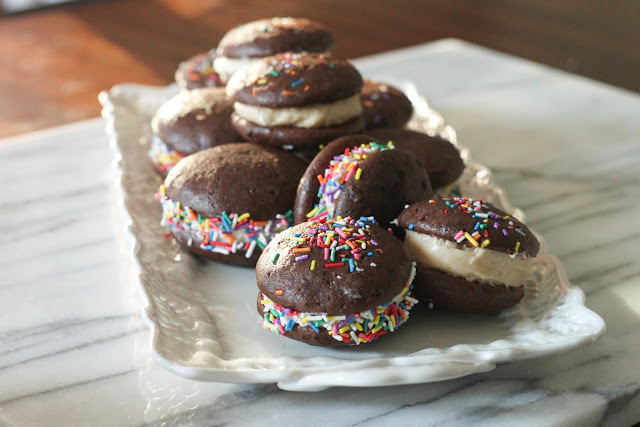 Whoopie pies have never been on my blog before, they are delicious cookie sandwiches that are so soft and fluffy it's like eating a cupcake in cookie form. I always find it odd to see peanut butter and cream cheese paired together but it is such a happy pairing. Just beware, you can eat quite a few of these in a delirious peanut butter stupor. This was my first time baking whoopie pies, but it definitely won’t be my last. I opted for a simple chocolate dough to create a pillowy, cake-like cookie that paired perfectly with peanut butter-cream cheese frosting. A note on the batter: It should be a bit stiff and not spread too much when piped. If it’s too runny, add another tablespoon or two of flour. This cookie sandwich is pure heaven for chocolate and peanut butter enthusiasts. Enjoy and happy baking! • Preheat the oven to 350 degrees. Line 2 baking sheets with parchment paper or Silpat mats. 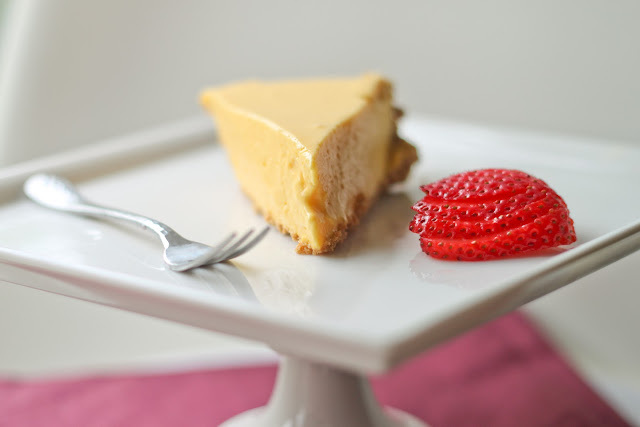 • In a large bowl, whisk together the eggs, granulated sugar, brown sugar, yogurt, oil and 1 teaspoon vanilla extract. Whisk in the flour, cocoa powder, baking soda and salt until just combined. Do not over-mix. • Pour the batter into a pastry bag fitted with a large round tip. Hold the bag perpendicular to the baking sheet and pipe 12 circles, leaving 1½-inches between each round. Repeat with the other baking sheet. Dust some of all of the tops with sprinkles, if desired. • Bake 8 to 10 minutes, until the tops spring back when lightly touched. Transfer to a rack and let cool completely. • Meanwhile, make the frosting by beating together the cream cheese, powdered sugar, peanut butter, milk and remaining 1 teaspoon vanilla extract on medium-high speed until fluffy and spreadable. 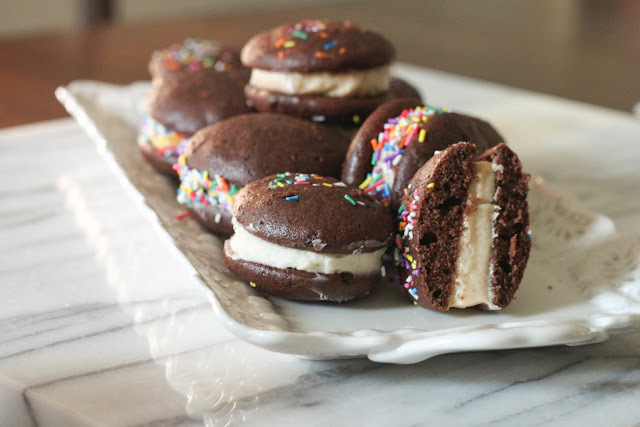 • Spread a layer of frosting on 12 cookies and sandwich together with the remaining 12 cookies to make whoopie pies. • Pour a layer of sprinkles in shallow dish. Roll the edges of the whoopie pies in the sprinkles so they adhere to the frosting. Whoopie pies will keep, refrigerated or frozen, up to 1 week in an airtight container.